During its years of existence, the cradle of professional drama survived the change of different names. In November of 2012 it gained the status of the national theatre for nurturing national dramaturgy, consistent educational activity and repertoire which distinguished by its idiosyncratic creative touch. Thus, now this theatre is called The National Kaunas Drama Theatre. The history and the present of this theatre is marked by names of such eminent directors such as H. Vancevičius, J. Jurašas, J. Vaitkus, G. Padegimas and G. Varnas. Directors of younger generation such as A. Jankevičius, Vidas Bareikis, Eglė Kižaitė are also actively and productively creating and realizing their ideas. The theatre’s troupe consists of 33 actors as well as visiting actors. At present four stages located in the main building and the smaller stages in wing building are used. They are the Main Stage, the Small Stage, Ruta’s Hall, the Long Hall. 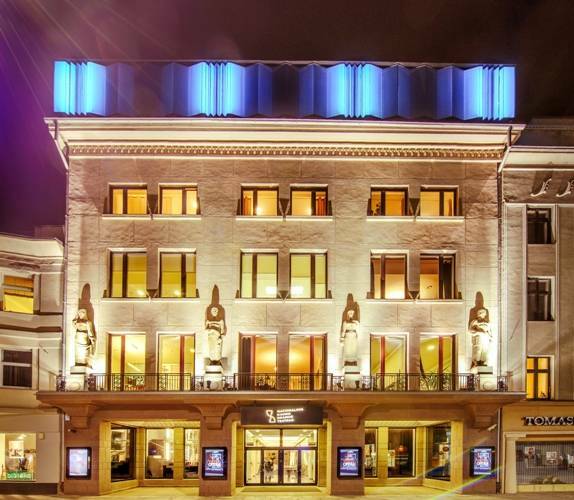 Each season about 350 events take place and 60 000 spectators visit the National Kaunas Drama Theatre. During a season spectators can enjoy 5 to 6 openings, an educational festival for young people “Plunge Into the Theatre” and at least one international festival or project.